How to draw Yuzu Kurosaki from Bleach Manga. Learn basic drawing technique for Manga, Anime and comics from step by step basic Manga drawing lesson. In this tutorial you will learn to draw a Manga character Yuzu Kurosaki along with basic Manga drawing tips and technique. First, I usually start drawing with simple geometry shapes to construct the basic Manga head and body. By following this process, you will find drawing is lot easier. The secret is to get the shape and proportion right in the beginning. If you understand its basic foundation, it will be easier no matter what you are trying to draw. You also have to make sure the shape of eyes, nose and mouth are correct and in the accurate spot. I usually start of using sphere or circle as a base for character’s head shape, then next step would be figuring out the next geometry form to fit into the image. Yuzu Kurosaki, 黒崎 遊子, is Karin’s fraternal twin and Ichigo Kurosaki’s little sister. Yuzu is more soft-spoken in comparison to her authoritative sibling. She is also the more empathetic of the two girls. She takes care of the housework, such as cooking meals and tidying up the living space, on a daily basis. She also regularly cuts Ichigo’s hair. Unlike her siblings, Yuzu is only able to see faint outlines of spirits as she is able to inform Ichigo that another ghost is present while they are about to sit down to dinner. 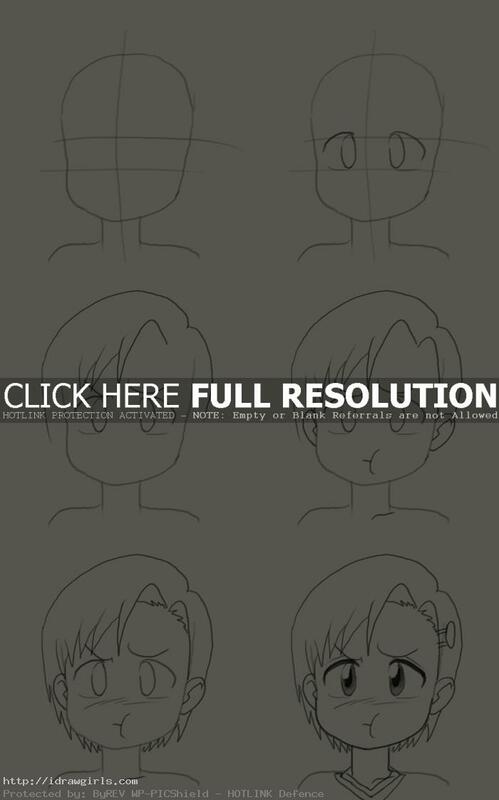 Below are step by step how to draw Yuzu Kurosaki. Step one, I drew a simple round head shape and basic measurement line for the face. Step two, I then drew her eyes inside the parallel horizontal lines. Step three, I added her eyebrows and bang for her hair. Step four, I added her pouty mouth and ears. Step five, I added additional hair on the bottom of her head from behind. Step six, I drew more detail onto her eyes and finished.